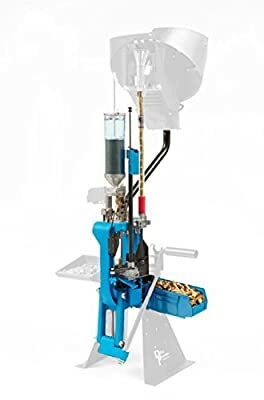 When you begin the search for the best progressive reloading press, you’ll soon discover that a handful of companies dominate this special market. They lead the way for a good reason – they produce dependable equipment that delivers results. This is great news for shooting enthusiasts who might spend a fortune on ammunition if they had to go to a retailer every time they needed a new supply. Shopping for a progressive reloading press should be based on three or four key features. Most customers will be looking for how many rounds per hour the press will deliver, along with the ability to change caliber and make adjustments. Of course, you’ll also be looking for a durable product that will give you service for the long term, along with the number of stations the press offers. Some products are designed to reload specific ammunition, while others will cover different types depending on the design details. The goal, of course, is to produce reliable cartridges in assembly-line fashion, to save you a lot of time and a lot of money. As mentioned, there are a few companies who make this happen – Hornady, Dillon, Lee, Lyman and RCBS will be the focus of these reviews. 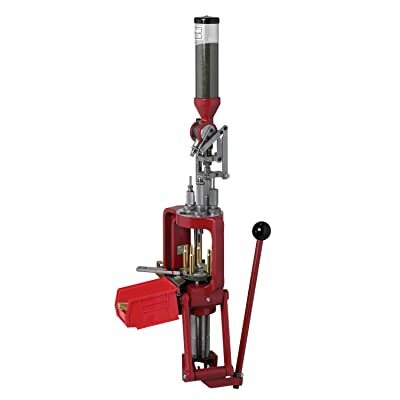 The word “best” may be a bit misleading when you are trying to choose a reloading press. You may find the best press for reloading several different types of ammunition offered along with best press for reloading a specific caliber, and you’ll have to purchase various accessories to extend the usefulness of the press. The question is, “What kind of press is right for you?” You might want to begin with a single-stage press, getting one reloading step at a time. This is a learning process for those who haven’t been reloading before. Your first lesson should focus on quality and safety, not on making ammo as fast as possible. Naturally, presses in this category will have a lower price tag, but will deliver precision reloads. Competitive shooters and serious hunters often use the single-stage press for quality control. Your next step may be to consider a turret press, which works with one cartridge at a time but has the dies you need for the complete process – installed and ready to use. You might classify the turret design as a hybrid or middle-ground press. Or, you can make the move to the progressive press. You’ll be reloading in the assembly-line fashion mentioned earlier, rather than completing one step at a time. Dies are held in a circle, with a cartridge under each one. When you pull the handle, a cartridge is engaged and the others are moved to the next position. Once a cartridge makes the complete cycle, it’s finished and ejected, to be replaced by an empty cartridge. It may take some practice to get the process moving smoothly while still producing safe, quality ammo. The top-line presses can deliver 400 or more rounds per hour. If your setup includes automatic case and bullet feeders, you could increase production up to 600 rounds per hour. Of course, you’ll pay quite a bit more for this convenience and precision. You’ll have to decide if that extra money is worth the investment (400 to 600 rounds per hour compared to 30 rounds on a single-stage press). As you shop for the best progressive reloading presses available in 2017, you’ll probably see rounds-per-hour numbers in the 400 to 600 range in most of the marketing material. Dillon, which is considered by some to be the standard for excellence in this industry, states the XL650 will produce as much as 800 rounds per hour. If you become proficient enough to make use of this top-shelf press, you’ll be able to prepare enough ammo for any situation. You can also choose to use both case feeders and bullet feeders to make the process even more efficient. This product has five stations to complete five steps, with automatic indexing for even quicker production. You’ll use only on manual move to set the bullet. The rest of the process is automatic, with dies remaining in adjustment. 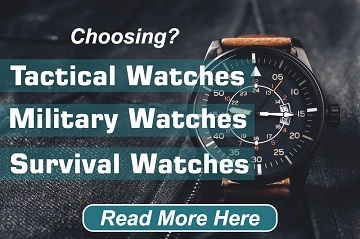 With all of these benefits, you also get durable equipment that should serve you for a long time. 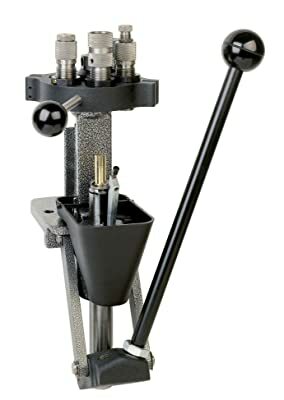 This is a heavy-duty press that also delivers efficient reloading every time. This unit stays maintains adjustment when you eject or replace dies, though initial adjustment takes some care and patience. The EZJect System from Hornady speeds up production without need for special adjustment. You can expect to produce up to 600 rounds per hour once you get comfortable with this press, which should be fast enough for anyone. Ease of operation is one of the key benefits of the Lock N Load, with five auto-indexing stations and quick-change dies. Change calibers from .45 to .223 in minutes. The collecting tray is placed to work as a key part of the process. You’ll also benefit from the powder-drop design, which makes the work more efficient and prevents accidental spilling. You will need to buy dies and shell plates. You may also find you need an “O” ring under the powder-station bushing to keep it firmly in place. The Lee Master 45 can be your less-expensive option, while still delivering 400 rph-speed and five progressive stations. The design accommodates larger rifle cartridges and includes automatic-indexing for consistent quality. Change from caliber to caliber smoothly with the removable turret head. 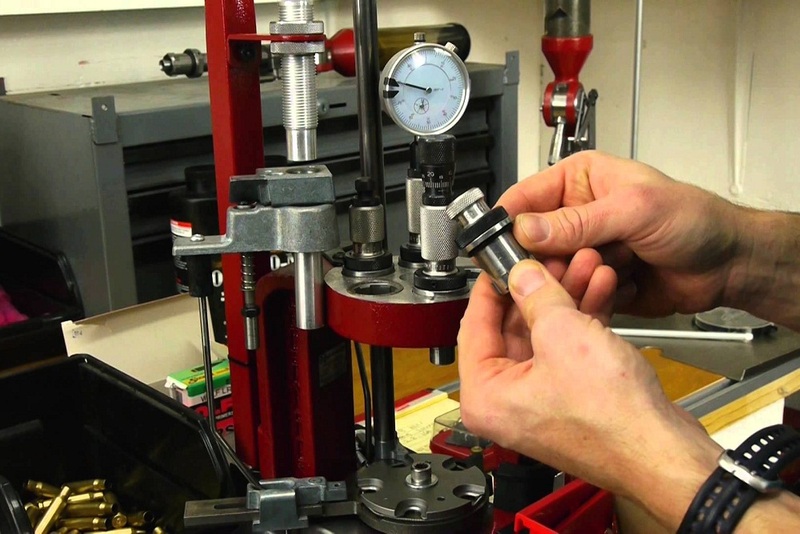 Set-up for specific calibers is very reliable, as the dies remain in place, with consistency in adjustment. Just switch the shell plates and you’re ready to work. The powder-measure system helps prevent spillage and leaking. Compatible with a wide range of die sizes. This is still a very durable unit, even at the lower price. You may notice some slight problems with the primer and powder measure, though this depends a lot on set-up and speed at which you operate. One of the features setting the Lyman T-Mag II apart from the others is the six-station operation. Caliber change is quick and efficient, with only the head-of-the-turret to be removed. Die adjustment remains consistent through this smooth process. This is a durable product that will give you years of service, even with its lighter weight. It can be mounted to wood or metal bench for extra stability. You will have to purchase dies and shell plates, as with the other presses. This is a smaller, lighter press, which makes it very convenient and easy to locate in your work space. The tray for primer is plastic but should serve all users very well. 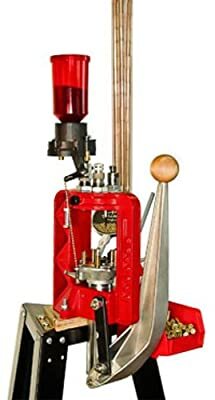 This press, also from Dillon, has all the features and delivers all the benefits you could possibly need in a reloading machine. It’s a five-station loader that includes a .223 conversion kit. Other dies are not included with the XL650. It offers a mechanically indexed shell plate, mechanically inserted cases, with manual-feed for bullets. Dillon markets this product as capable of 500 to 800 rounds per hour. New users will find this unit easy to assemble and easy to use. Case feeder design helps this press deliver smooth, efficient operation. It’s rather easy to summarize the benefits and features of the five presses mentioned here. They all will deliver good performance, with budget being one of the deciding factors for most shooters. As noted, Lee offers a very-serviceable loader at a lower price than some of the others. But, if you want capability and speed, you’ll probably choose the Dillon or Hornady. Of course, Lyman makes a very good press as well. It’s manufactured for durability and long-term use. As you shop for your press, keep in mind there are three types you’ll have to choose from. The single-stage press is basic and can produce about 100 pieces per hour. The turret press is the next step, with multiple die stations The progressive press (five reviewed here) means you just install and adjust the dies and you’re ready to go. But these may not be right for a true beginning reloader, so keep that in mind. Think – fast production rate. I’ve been interested in reloading my own ammo for some time now but haven’t pulled the trigger yet. I’ve heard different estimates on how much money you can save in the long run but dunno if I’m patient enough to do my own ammo. A friend of mine does his own for shooting competitions since it has improved accuracy. I guess I’m rambling at this point but I should probably just go buy one, lol. Do you still like the Lee Precision Load press? Please show me any Dillon that is faster than this press.